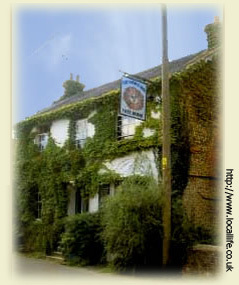 1836 The owner, Charles Chatfield, is granted a licence to sell ale. He sets up his hostelry, later extending the premises to add a new frontage in the Victorian style, while retaining many of the original features within. 1841 The house and garden appear on the Tithe Map. The residents at the time were William Holden, agricultural labourer and Thomas Marsh. 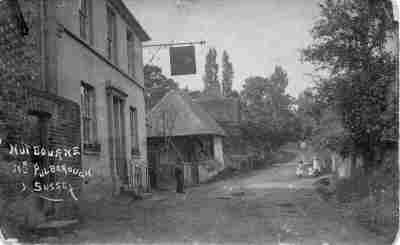 1910s As the social centre of the village, the landlord is able to bring moving pictures to Nutbourne, adding a small cinema in a back room for silent movies. It is said that thanks to the excellent refreshment on offer the early Chaplin and Keaton films were even funnier than usual ! 1930 The arrival of talking pictures meant that the cinema gradually changed use to a clubroom for village activities, playing host to meeings of the Nutbourne Women's Institute from 1953 until 1968, as well as serving as the local polling station, a role retained to this day. 1954 Charles and Joan Vickers are publicans, living in The Rising Sun with their daughters Kay and Carol. 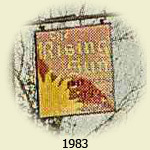 1981 The Howard family takes over at The Rising Sun, with Regan and Janice Howard the publicans and their sons Tristan and Oliver. 1980s Local farmer Clive Allen regularly takes his prize steers to the bar for a daily pint! 2010 Tristan and Oliver Howard are the landlords and have maintained the charm and elegance of The Rising Sun as a focal point of village activtity, offering fine ale, a selection of wines, good home-cooked food to order and an unspoilt atmosphere that is unrivalled for miles around - a proper pub and garden with special rural appeal. 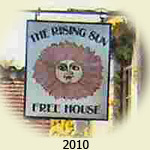 The Rising Sun is a fine old stone building, which was extended in Victorian times. over 170 years while retaining its charm and distinctive personality. acting as both projectionist and usher, offering refreshments that were unrivalled anywhere in Sussex. 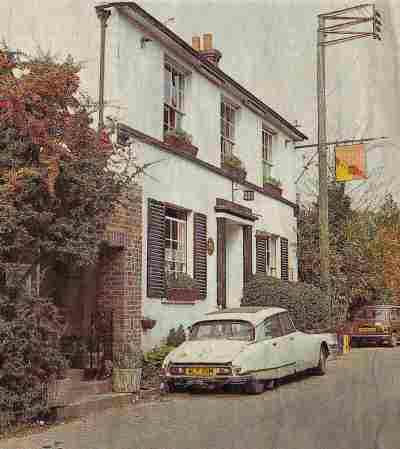 doubling-up as a polling station and headquarters for the local Women's Institute from 1953 until 1968.
the bar for their daily pint in the 1980s - truly a sight to behold! that is well worth seeking out and enjoying.